In 2005 I wrote a review of George R.R. Martin's novel A Feast for Crows in which I called him "the American Tolkien." The phrase has stuck to him, as it was meant to. I believed Martin was our age's and our country's answer to the master of epic fantasy. Now it's six years later, and I've read Martin's new novel, A Dance with Dragons, and I'm happy to report that I was totally right. Martin has produced  is producing, since the series isn't over  the great fantasy epic of our era. It's an epic for a more profane, more jaded, more ambivalent age than the one Tolkien lived in. Tolkien was a veteran of the Somme, and The Lord of the Rings was partly written during World War II. (It was published in 1954.) Tolkien wrote at a time when it really seemed as if a war was on for the fate of civilization. Now we're not even sure what civilization is. George R.R. Martin (his R.R. stands for Raymond Richard; Tolkien's stands for Ronald Reuel) was born in 1948. He didn't serve at the Somme, though he may have played through it once or twice in a video game. A Song of Ice and Fire  which is the rather florid title of Martin's series  is an epic for us, for the way we live now and the way we fantasize now. Look at Martin's map. In Middle Earth there were two sides: the war was between good and evil, right and wrong. It was hobbits and elves and dwarves and men coming together to fight Sauron. Martin's books are set (largely) on the continent of Westeros, which has been shakily cobbled together into a nation known as the Seven Kingdoms. Not two: seven. Westeros is in chaos; it's a political jigsaw puzzle, and somebody just turned the table over, and everybody is on the floor scrabbling for pieces. It's impossible to know whom to root for. "Many good men have been bad kings," one character says, "and some bad men have been good kings." Not even God decides who is wrong or right. Each side has its own gods, and they'll back whoever prays to them. 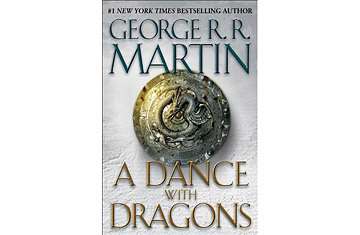 A Dance with Dragons is the fifth volume out of a planned seven, and in many ways it's the best. Martin was marking time a little bit in Feast for Crows, pushing his pawns up the board but leaving his big pieces alone. Now the camera has swung back to the main characters: Jon Snow and Daenerys Targaryen and Tyrion Lannister, the brilliant, black-witted dwarf whose family has had the firmest grip on power for much of the series, though that's not saying much. Tyrion is another good example of what separates Tolkien and Martin. Tyrion isn't a hearty, ax-wielding, gold-mining member of a noble dwarven race. He's not Gimli. Tyrion is an actual dwarf, achondroplastic and stubby-limbed, a joke to passersby and an embarrassment to his family. (The rest of the Lannisters are stunted too, but on the inside.) Tyrion is on the run because at the end of A Storm of Swords he fatally shot his father Lord Tywin in the groin with a crossbow bolt as Tywin sat on the toilet. We catch up with Tyrion at the beginning of A Dance with Dragons crossing the Narrow Sea in a state of shock at his own actions. A long-expected meeting is approaching. Tyrion is vectoring toward the exiled Daenerys Targaryen, who has been isolated from most of the rest of the players in the series until now. As the daughter of Aerys Targaryen, the last (mostly) uncontested king of Westeros, Daenerys has one of the better claims to the throne. She's been running wild in the exotic lands to the east of Westeros in the company of three feral dragons, beasts not seen in that world for at least a century. She rules the city of Meereen. (She is guarded by, among others, Ser Barristan Selmy, an aging, immensely dignified knight of Westeros who wonders how duty has led him so far from home  and into such strange company. He and Tyrion are Martin's finest creations.) Two of the great narrative arcs of the series are bending toward each other, and when they meet, current will flow. But this being Martin, there are a lot more than two arcs in play. Jon Snow is sitting uneasily astride the great Wall in the north; Theon Greyjoy is languishing in the sadistic hands of the Boltons; prim, stilted Stannis Baratheon  he's the Al Gore of Westeros  is pursuing his claim to the throne; Arya Stark is training as an assassin and plotting revenge; a dorky Dornish prince is trying to find and marry Daenerys. The soil of Westeros is rich in story the way some countries are rich in uranium. There is no such thing as a stock character or a cardboard village there: every person, every wood and stream and street corner has its own tale. After five volumes Martin is, if anything, a better writer than when he started. If you're watching A Game of Thrones on HBO, you're forgoing the great pleasure of Martin's deft prose. Like Wagner, he gives each of his characters leitmotifs that recur and recur in their streams of thought. "You know nothing, Jon Snow"; Daenerys' theme is "If I look back I am lost"; Tyrion is haunted by his father's last words, "Wherever whores go." These phrases are like dragons' eggs: the characters keep them close, in the hopes that one day, if they think them enough times, the words will hatch forth the wisdom they desperately need. But the real power of Martin's work arises from his extraordinary skill as a plotter. A Dance with Dragons follows, by my count, 11 major story lines, as well as assorted minor ones, each with its own rhythm, written in its own voice, and each playing off all the others. Martin will never win a Pulitzer or a National Book Award, but his skill as a crafter of narrative exceeds that of almost any literary novelist writing today. Throughout the book I was reminded of Jennifer Egan's A Visit from the Goon Squad (which did win a Pulitzer), as well as Anthony Powell's (similarly floridly titled) A Dance to the Music of Time. But even Powell can't twist a plot like Martin. A Dance with Dragons is a big book, topping out at 1,016 pages, but it turns on a dime. Reading a novel is a little like commanding a battle: you're always reconnoitering, trying to guess where the author will go next, what's a feint and where the action is really heading. I don't know when I have ever been as comprehensively and pleasurably outgeneraled as I am when I read Martin. He raises and raises the stakes, long past when any other writer would have walked away from the table, and just when you think he's done, he goes all in. There is, apparently, no piece he will not sacrifice, no character that you (and one suspects, he) love so much that he will not orchestrate that character's doom. The complexity of Martin's design ensures that we experience the struggle for Westeros from all sides at once. It's as if he's trying to show us that every fight is both triumph and tragedy, depending on where you see it from, and everybody is both hero and villain at the same time. Or maybe not even that. "There are no heroes, only whores," says Theon. On the strength of A Dance with Dragons, it's hard to prove him wrong. See what the authors are reading in TIME's summer reading list. See the All-TIME 100 novels.